Question: What program & how do I monitor a folder and its subfolders for new or modified PDF or other image files, and automatically convert to text searchable PDF's? Is there a solution on VeryPDF? 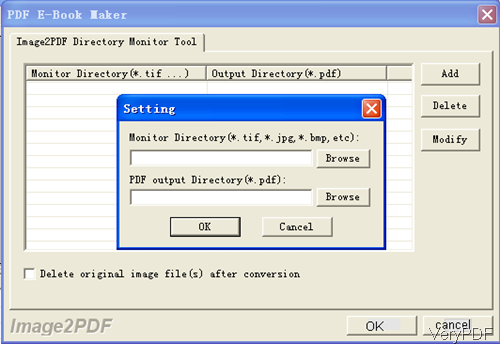 Answer: When you need to monitor a folder and its subfolders for converting modified PDF and image to searchable PDF, maybe you can have a free trial of this software: VeryPDF Image to PDF OCR Converter GUI version, by this which you can run the conversion through software interface by monitoring many folders or subfolders. When you need to monitor folders, please make sure download the GUI version. By the command line version, you can not monitor folders. For batch mode conversion by command line you can write bat file or using wild characters. This software supports input file formats like PDF, TIF (TIFF), JPG (JPEG), GIF, PNG, BMP, PSD, WMF, EMF, PCX, PIC, etc. Please check more information of this software on homepage, in the following part, I will show you how to use this software. Step 1. Install Image to PDF OCR Converter. When you go to Try and Buy website, please make sure download the right version. There are normal version, GUI version, command line version, COM version and others. Please make sure choose Image to PDF OCR Converter GUI version. When downloading finishes, there will be an exe file. Please install this software by double clicking the exe file and following installation message. The following snapshot is from the software interface, please have a check. Step 2. Convert PDF and image to searchable PDF by monitoring folders. Like I showed in above snapshot, after opening software interface, please set monitoring folders. Click button File then go to Monitor a special Directory, you will see the following menu tab. Click button Add you can specify monitored folders. And there is no limit about how many folders could be monitored. Click Add button repeatedly you can add monitored folders as many as you need. After specifying monitored folders, please click Setting button at the bottom. Go to the last tab, please choose OCR mode to run the conversion. The following snapshot is from the OCR mode tab, pleas have a check. 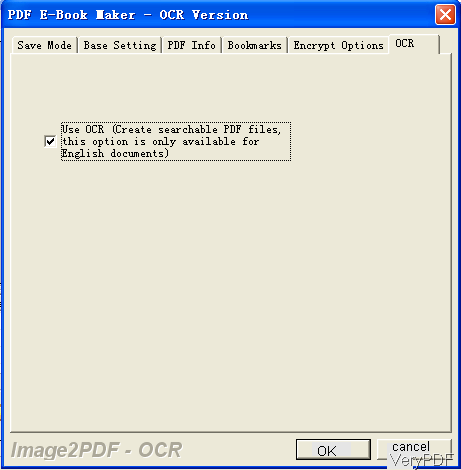 Please choose this option named like Use OCR create searchable PDF files, this option is only available for English documents. When you need to process non-English documents,please use OCR to Any Converter which supports more than 50 OCR languages. All the settings have been done. Once you add files to monitored folder, all of them will be converted to searchable PDF file at once. By this software and this method, we can convert PDF and image to searchable PDF by monitoring folders. During the using, if you have any question, please contact us as soon as possible.